A winner at any price! 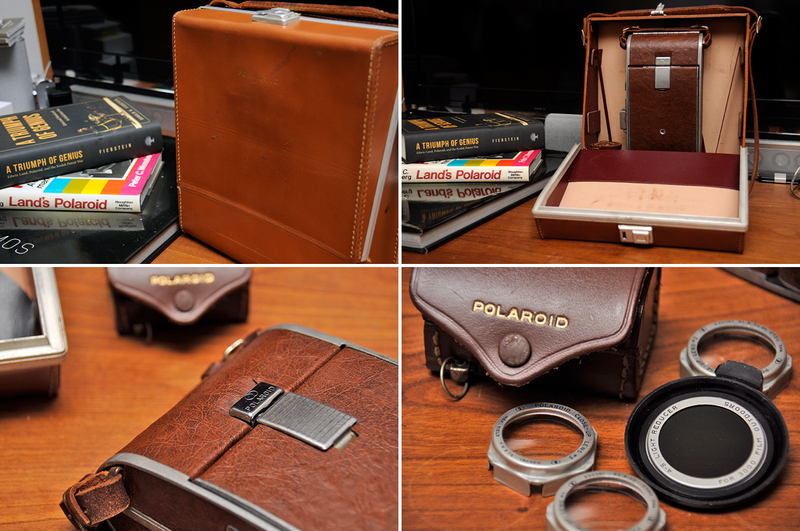 When we went to a book signing recently for A Triumph of Genius: Edwin Land, Polaroid, and the Kodak Patent War, we got to handle the iconic camera the Polaroid Land Model 95, the first commercially available model from the Polaroid Corporation. 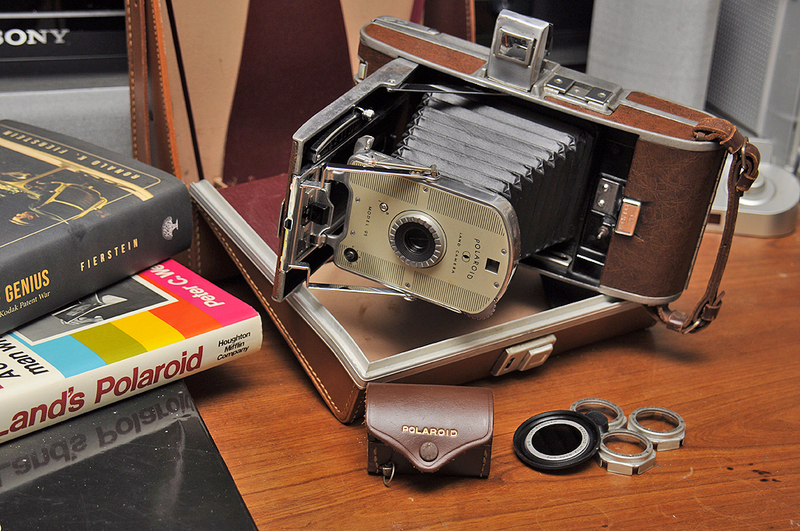 The engineering aspects and Mid-Century styling of this piece of photographic history were marvelous. 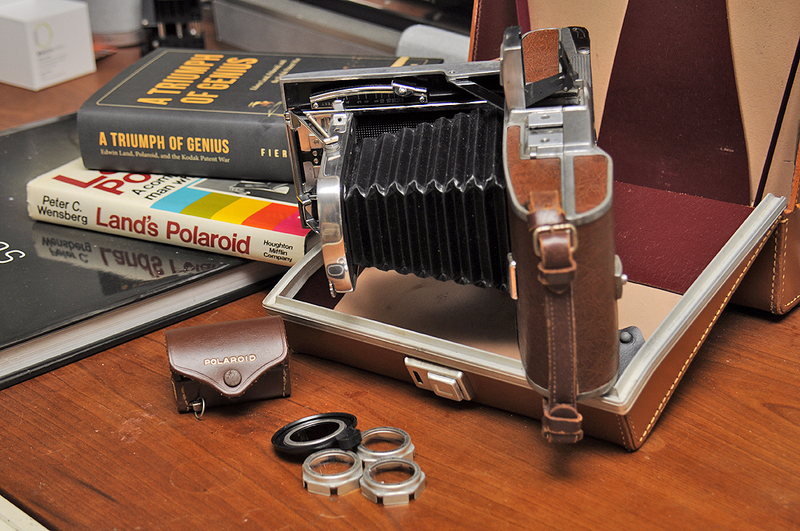 Ron Fierstein, author of A Triumph of Genius, mentioned that he got his Model 95 on EBay for a very reasonable price. 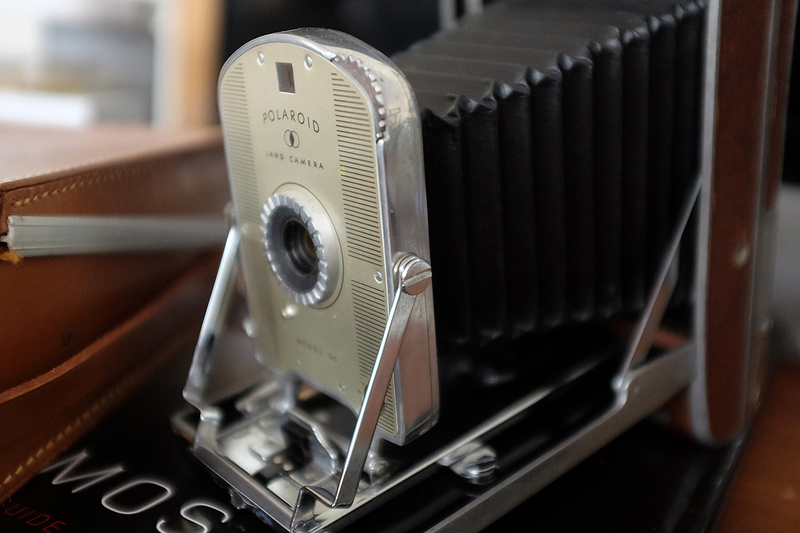 After our visit to the MIT Museum and seeing the camera again in their Polaroid Collection (given to the museum by the estate of Dr. Land), we thought we would enjoy having our very own Model 95. While we prefer to shop for things like this on Craigslist, we had go the EBay route as there were no Model 95s available locally. The interns located a unit on EBay with just a few hours left in the auction. 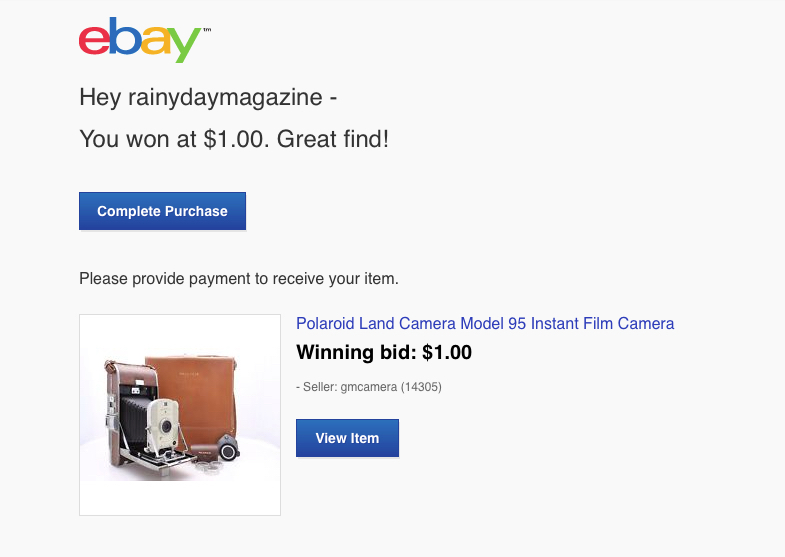 It was still listed at its starting price of $1, so we put in an offer. We were certain that savvy buyers would swoop in seconds before the end of the auction and increase the price to some lofty height. Our first reaction when we won the EBay auction was “What??? Nobody else wanted this?” AWESOME!!! The condition of the camera was pretty good. It did have a musty scent, but considering its age, that was not surprising. There were some tiny patches of rust inside of the back, but all of the external stainless steel bits were in excellent shape and polished right up with some NeverDull. The slide, bellows, and all of the other mechanicals appear to be in good working order. The only part which had some issues was the glass in the lens. There were some mold/fogging on the edges. However, as the camera will likely never see any film, the issue was academic. Check out the spring guide for aiming, the range setter, and the exposure control wheel! All of them were designed as engineering solutions for the specifics of working this camera. What we like is that, like the Apple products of today, they are wonderful to look at as well as being absolutely functional. It is quite a treat to be able to examine all of the details up close. We will enjoy owning this piece of mid-century art, even if it is going to be coolest camera we have that we will never be able to use!